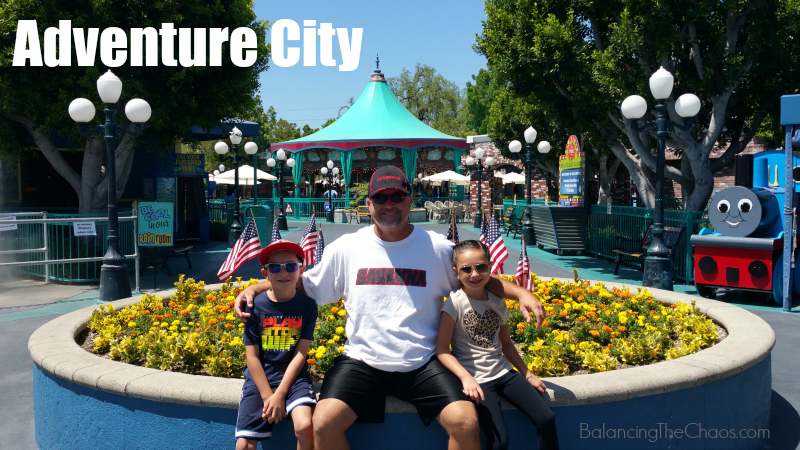 We’ve slowly been crossing items off the Summer Bucket List, which took us to Adventure City last week. 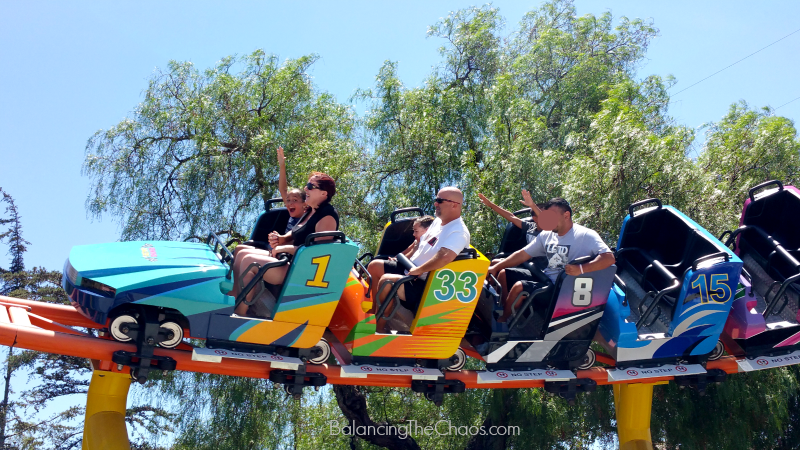 An adorable little amusement park in Anaheim, just down the street from Knott’s Berry Farm, Adventure City is perfect little theme park for ages 1 to 12. 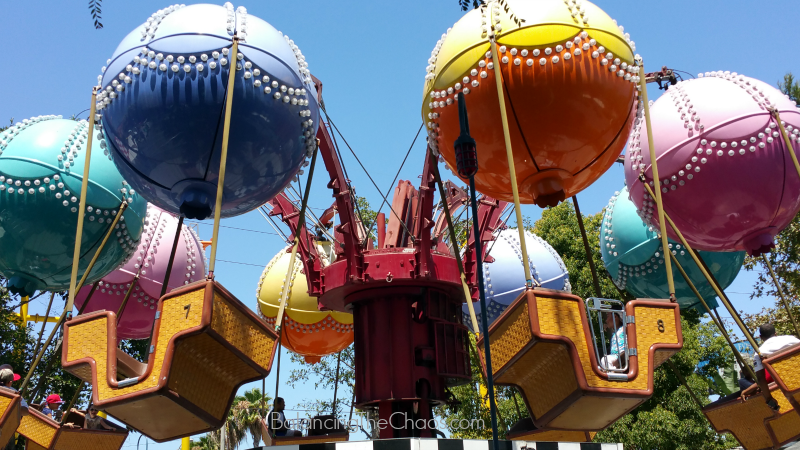 They have 11 rides that includes roller coasters, a train that goes around the park, a climbing wall, and a balloon ride. 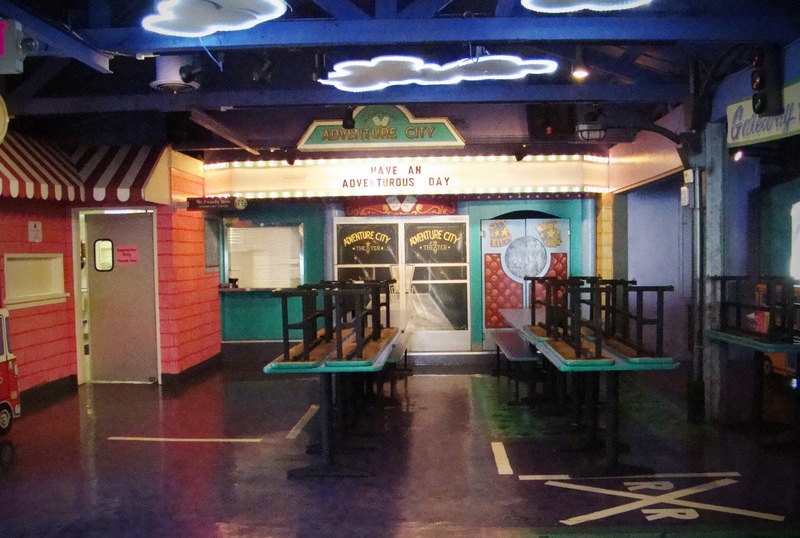 They also have 8 other attractions and events like a petting zoo, shows throughout the day, an arcade and a party station. It all started 20 years ago as an expansion on Hobby City, which was a miniature railroad attraction and museum. Adventure City opened in 1995 and marketed as an affordable family fun amusement park. So, while we had a day free, we decided to meet up with some friends so the kids could check out the newest addition to Adventure City. My daughter is a little more adventurous then my son, so she went on it with dad and friends. 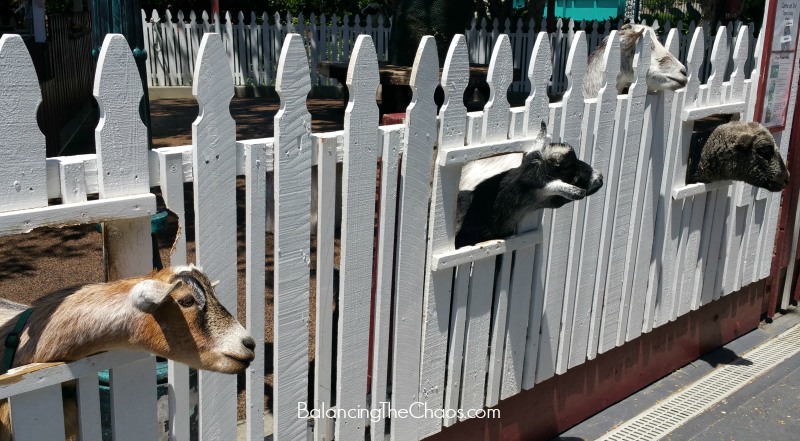 One feature attraction that Adventure City has that my kids love is the little petting zoo. Have the opportunity to take a selfie with these cute animals and give them a quick bite to eat. You’re sure to get a giggle as they pop their heads out of the fences – like this. They have 2 large banquet sized rooms for parties like the one. In this room, there is a section off to the right where the train actually goes through the room – so much fun! Even the birthday boy/girl gets to be the engineer for the train their big day! Go here for information regarding birthday parties. Adventure City is not open daily – they do have a specific schedule as they are only open on weekends through the winter, but as spring gets closer, they are open more days through the week. Check out their Park Schedule for the particular day you want to visit! For information about admission and park hours, go here. Unfortunately, they do not have an annual pass, but if you sign up for their e-newsletter, they do email out coupons every so often. Giveaway ends Aug 14, 2016 at 11:59 PM PST. Open to US Residents 18 and older only. Tickets will be mailed directly to the winner’s home (or mailing) address. Winner will be selected at random and be notified by email. Winners have 48 hours to respond before a new winner is selected. Not liable for unclaimed prizes or fulfillment. Blog has represented each sponsor with the expectation they will fulfill their prize and in a timely manner. No purchase necessary to enter or win; however you must enter for a chance to win. Purchase does not increase chance of winning. Chances of winning depend on number of entries. My opinions are my own and were not influenced by any form of compensation. Facebook, Twitter or any other social media platform are in no way associated with this giveaway. By providing your information in this form, you are providing your information to this blog. I do not share or sell information and will use any information only for the purpose of contacting the winner. Winners can only win once per month. Not liable for unclaimed prizes or fulfillment. I’ve been wanting to check this place out- looks like a lot of fun! 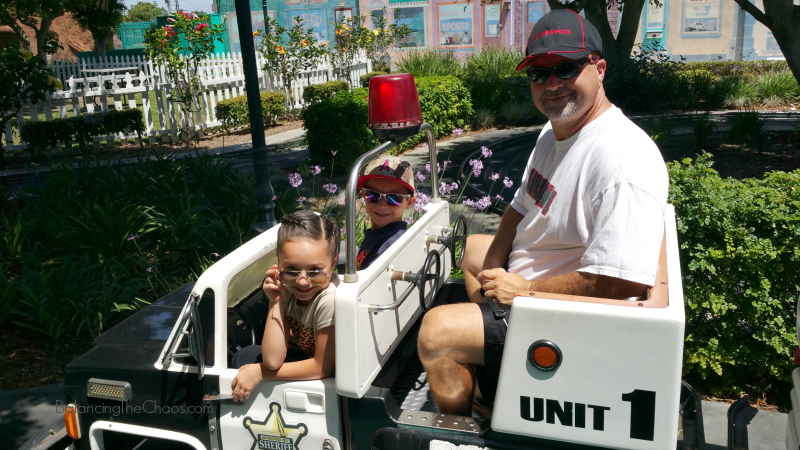 During the summer, we love going to the beach and OC fair. My favorite summer activity is to check out places we haven’t really frequented in awhile or visited before. Of course, splash parks and pools are a must to beat the heat. OC Fair is also a must! we like to go to the beach and the pool. Just double checking I didn’t miss anything before leaving my comment, We love spending time together as a family that’s everything to us. But if it was something we enjoy doing this summer is our walks to the park or the lake. Fingers crossed, thank you so much for the opportunity! Goodluck everyone.